In the workplace, teamwork is at the center of productivity. When we work better together, work gets done faster and better—and we enjoy it a whole lot more too. This month, we’re highlighting six new apps that can keep everyone on track and in sync. Their features help schedule meetings and events, share knowledge with coworkers, prioritize and track pieces of your product roadmap, and celebrate collective wins. All of these apps (and many, many more) can be found on our Slack App Directory. Event coordination can be a challenge in any size office, and that’s where Eventbot can help. Think of it as your team’s calendar. You can create events, invite individual users, share those events across channels, and collect RSVPs, all without leaving Slack. You can even see a visual calendar of your events inside Slack. Eventbot connects with a variety of different calendar systems, including Outlook and Google Calendar, letting you track work and personal events. For the past decade, Stack Overflow has been the best place to ask questions about computer programming anywhere, period. 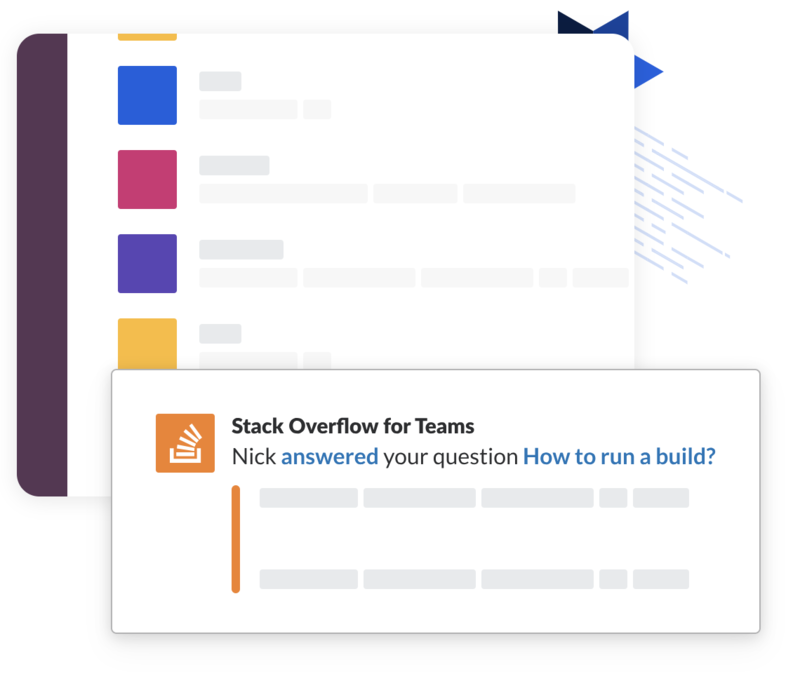 The company’s newest product, Stack Overflow for Teams, lets you create a private Q&A site especially for your organization, and it’s now available as an app in Slack. Use it to look up previous questions and answers without leaving Slack, create new questions from the message actions menu, and get notifications when people ask new questions or leave answers for yours. Creating polls, tracking tasks, and organizing meetings are just a few of the helpful features that Kyber’s robust new app offers. It can run stand-up meetings or schedule future messages to drop into your announcement channels, all from a slash command or the message actions menu. 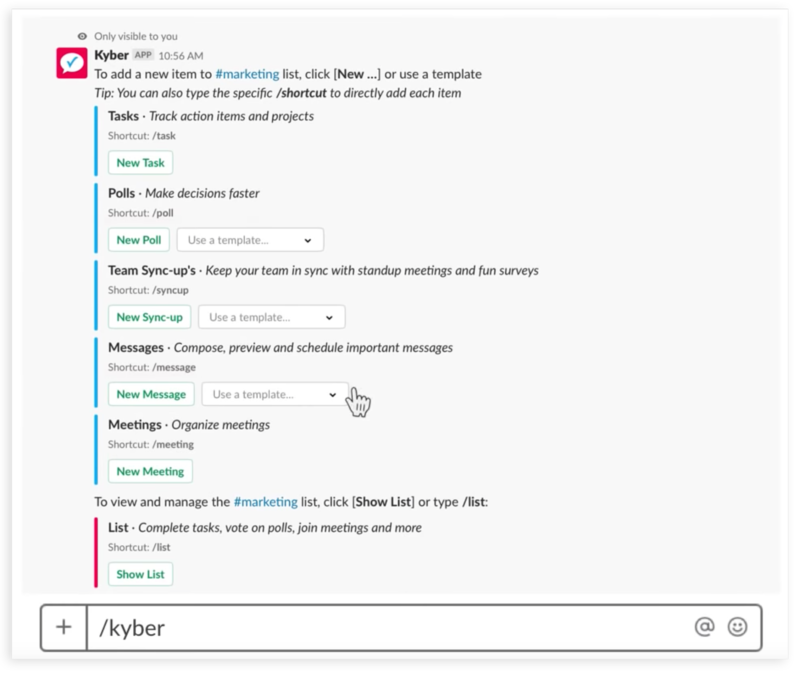 Kyber can list all of your outstanding tasks and poll results across your workspace and even post a list of relevant items in each Slack channel, giving your team a summary of their outstanding tasks. The app also introduces templates that let you create, customize, and configure your own versions of tasks, polls, questions, and messages. These are specific to your team, so you can reuse them easily. Sales and marketing teams that use People.ai to capture their contacts and track revenue activity in Salesforce are going to like its new Slack app. Once installed and configured, People.ai can report into Slack channels when big deals are closed or lost, with one-click access to key performance insights about those deals. Productboard is a service used by product managers to help track new-feature requests, prioritize their team’s efforts, and share future plans in team roadmaps. Its new app for Slack makes it easy to push new messages and replies into channels when they’re posted and keep teams notified of new activity on their work. 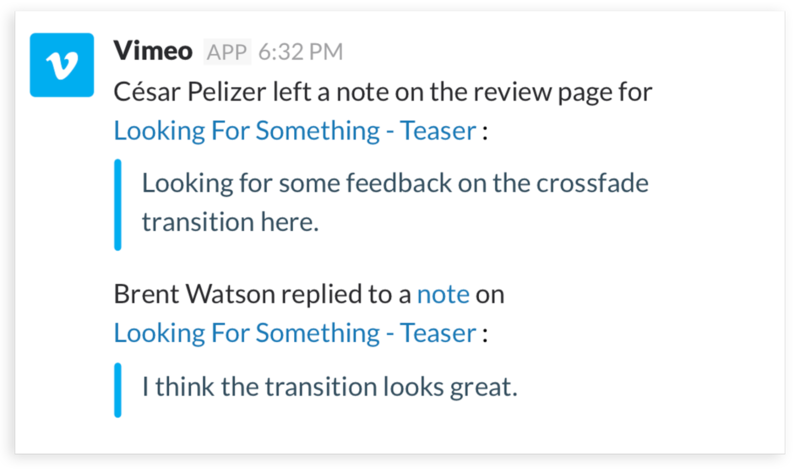 You can even create a new note from any message in Slack, with message actions. Vimeo projects are private workspaces for your team’s video work, and they make it easy for teams to organize, customize, and collaborate on videos. Once Vimeo is enabled in Slack, your whole video team can get updates when new notes are left and replied to on your Vimeo videos, when new videos are added to a project, and anytime changes are made to things like metadata, privacy levels, and selected thumbnails. Our App Directory, like our universe, is ever-expanding. To see what else is new—and how the latest apps can help your team be more productive at work—visit slack.com/apps.